PM Modi is the only occupier of a constitutional post in the history of Independent India who declared himself to be a Hindu nationalist. He made this declaration in 2013 in an interview to two Reuters journalists, Ross Colvin and Sruthi Gottipati, on July 12 as CM of Gujarat. [i] Modi glorified his Hindu nationalist identity hiding the fact that the term ‘Hindu Nationalist’ originated in a specific historical context during India’s freedom struggle against the British colonial masters. This freedom struggle was mainly led by the Congress, which stood for an all-inclusive democratic-secular free India. The ‘Muslim Nationalists’, under the banner of the Muslim League, and the ‘Hindu Nationalists’, under the banners of the Hindu Mahasabha and the RSS, opposed it, claiming that Hindus and Muslims were two different nations. These Hindu and Muslim ‘Nationalists’ joined hands with the colonial masters in order to thwart the freedom struggle so that they could have theocratic states of their choice, ‘Hindusthan’ or Hindu Rashtra and Pakistan or Islamic state, respectively. Moreover, those Hindutva fanatics who assassinated MK Gandhi on January 30, 1948 also called themselves as Hindu nationalist. Modi’s commitment to Hindu nationalism keeps on motivating him to acts crossing all limits of hypocrisy; an integral part of the Hindutva politics. 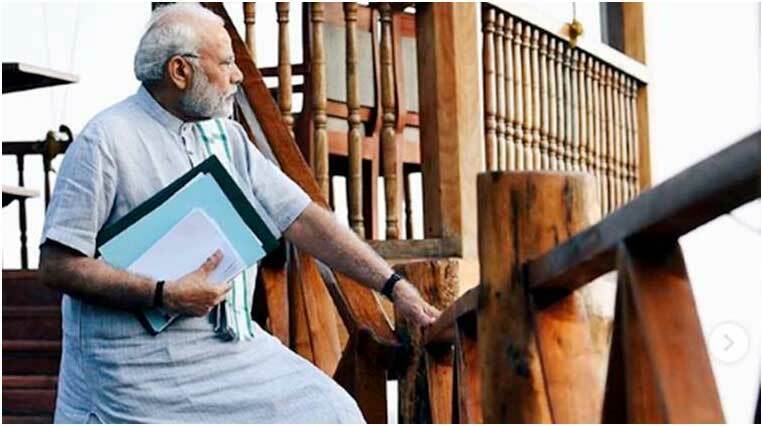 In the last week of 2018 he was on tour of Andaman & Nicobar Islands where the infamous Cellular Jail is also situated. Interestingly, during January-February this area, with fine weather conditions, is also the destination of thousands of government employees from all parts of India who flock to this area with their families for pleasure trip availing LTC; a partly government funded scheme. According to press reports immediately after reaching there he visited the Cellular Jail, sat in the cell where VD Savarkar was incarcerated. PM also hoisted a 150-feet-high national flag; the Tricolour in Marina Park, South Point, in Port Blair and said the government is committed to creating an India, Netaji Subhash Chandra Bose once dreamt of. There cannot be a greater crime then putting Savarkar and Subhash Chandra Bose on the same pedestal. 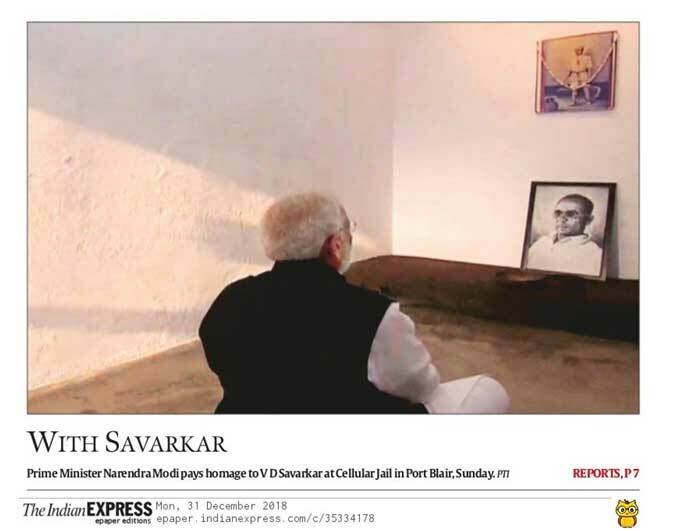 Modi as a seasoned RSS cadre while worshipping Savarkar maintains criminal silence about anti-national ideas and activities of the latter. Or the fact may be that RSS loves Savarkar for this kind of heritage of his only. It is important to note here that even the Muslim League, sub-serving the interests of the British rulers, refused to align in these war efforts or join Defence Committees established by the British government as done by Savarkar. It is sad for India with glorious tradition of anti-imperialist struggle that children of those who criminally betrayed Netaji and his INA by siding with the British rulers are playing mischief with the icons of all-inclusive anti-colonial struggle. What right PM Modi has to talk of Netaji and INA which fought for a democratic-secular India when he as an ideologue of the RSS and BJP declares himself to be a Hindu nationalist, committed to turn India into a theocratic Hindu state and belittling the minorities? It did not take long for the post to go viral, with many complimenting the prime minister’s latest look and the photographer for the “amazing” click. It was shocking that PM was talking of sacrifices of brave heroes of Indian freedom struggle while showing off his new attire. Modi’s spineless fans remained oblivious of the fact that at a place where hundreds of Indian revolutionaries died of torture, want of food, clothing and medicine, this kind of presenting of new dress on a ramp was not only abhorring but making fun of the sacrifices of the Indian freedom fighters. No national leader ever did it but only Hindu nationalist PM of India had the guts to do it! [iii] A. S. Bhide, (ed. ), Vinayak Damodar Savarkar’s Whirlwind Propaganda: Extracts from the President’s Diary of his Propagandist Tours Interviews from December 1937 to October 1941, na, Bombay, 1940, p. 469. [iv] Cited in Savarkar, V. D., Samagra Savarkar Wangmaya: Hindu Rashtra Darshan, vol. 6, Maharashtra Prantik Hindusabha, Poona, 1963, pp. 460-61.